No limits on offshore ambitions - Rotterdam. Make it Happen. The port of Rotterdam provides plenty of opportunities for offshore companies. And those companies most assuredly find their way to Rotterdam. For instance, Allseas’ megaship Pioneering Spirit is being finished in the Prinses Alexia harbour and the Dockwise Vanguard loaded up the world’s heaviest cargoship in the world, the Armada Intrepid, right here in the port of Rotterdam. Another important development is the agreement between the Rotterdam Port Authority, Sif Group and Verbrugge International to build a terminal for production, storage and transshipment, to aid the production of steel foundations for the offshore industry. The fact that the offshore industry is doing so well in Rotterdam is not just because the Rotterdam Port Authority provides space for offshore activities. Other factors play an important role as well. For instance, Rotterdam has a strong cluster of offshore and related companies which have all the knowhow and infrastructure at their disposal to handle even the biggest, toughest, most advanced offshore projects. 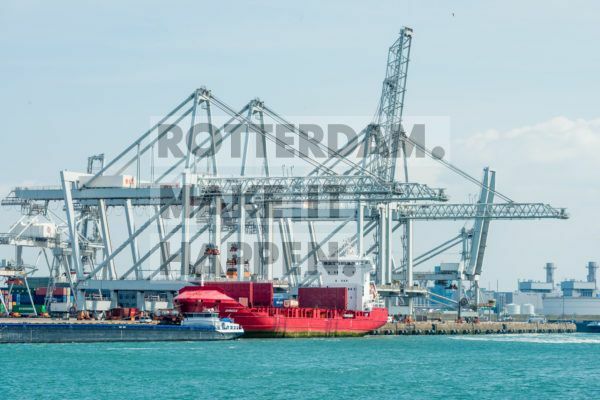 Rotterdam has Europe’s biggest fleet of floating cranes and on-board lifting jacks for the heaviest lifting activities. The shipyards can accommodate all types of offshore platforms; the biggest platform can be repaired in a megadock of 405 by 90 meters. In addition, Rotterdam has many equipment suppliers, which leads to a wide variety in choice and great value for money. And it is not just the big players that choose Rotterdam, either. Ampelmann, a former start-up, developed into a global player right here in the port of Rotterdam. Right now, current start-up Fistuca is testing its Blue Piling Hammer at a test location on Maasvlakte 2, a promising innovation which can lay foundations for offshore wind farms and anchor points for oil and gas platforms at the bottom of the ocean more cheaply and quietly by using an innovative ‘falling column’ pile-driving technique. In short, Rotterdam excels in possibilities for the offshore industry. In Rotterdam, we do not set limits on your ambitions. Rotterdam is where it’s all happening.